ATLAS F1 Volume 7, Issue 1 by Thomas O'Keefe, U.S.A. It is not a long history, but it is a distinguished one that Mercedes-Benz has forged with the Indianapolis Motor Speedway. To begin with recent history, who can forget the spectacular sight of the McLaren-Mercedes team slipstreaming off the Turn 13 banking and down the front straightaway at Indianapolis on September 23, 2000, during Qualifying for the Inaugural U.S. Grand Prix at Indianapolis, with Mika Hakkinen short-shifting and kicking up the dust in the slow lane while letting David Coulthard by to improve his top speed on the straight. Even the typically reserved Ron Dennis, team principal for McLaren, was caught up in the romance of the moment at Indy, theorizing in response to a question as to why the Indianapolis crowd seemed to go so wild at the distinctive sound of the Formula One engines. Dennis opined that what the crowd seemed to love was the engine note of the high-revving V10 engines, and admitted that it gets to him too at the Cathedral of the Speedway, with its towering grandstands on both sides of the narrow track, seating some 250,000 people: "The engine note still gives me a tingle, particularly down a confined space as we have here on the front straightaway." Mercedes-Benz and its derivative companies have been thrilling race fans at the Indianapolis 500 going back to its earliest days, as well as in the American races that were the predecessors to the Indy 500. Interestingly by the way, the mellifluous and evocative name "Mercedes" came not from Karl Benz or Gottlieb Daimler, but from a young girl named Mercedes Jellinek, daughter of Emile Jellinek, the Consul in Nice to the old Austro-Hungarian Empire, who was also active in The Daimler Company and in the development of the specially built sports racer that the Daimler Company christened Mercedes. By 1903, the Mercedes 60 HP built by Benz and driven by Camille Jenatzy won the Gordon Bennett Trophy race at the Athy circuit in Ireland, its first international success. In 1904, Mercedes came to the United States to race for the Vanderbilt Cup on Long Island in New York. In 1908, Mercedes driver Emil Stricker was the only foreigner contesting the Vanderbilt Cup road race, the other "foreign" cars deciding to focus on the Automobile Club of America's American Grand Prize race in Savannah, Georgia which offered a purse of $4,000, twice that offered by the Vanderbilt Cup. By August 1909, American drivers had already begun to run the European road racing cars on American oval tracks. Indeed, Barney Oldfield, America's first motor racing hero, driving a Benz, set the fastest top speed of 83.1 mph over 1 mile in a time trial in August 1909 at the Indianapolis Motor Speedway, two years before the running of the first Indy 500. At Daytona-Oromonde Beach a year later, Oldfield set a 1-mile Land Speed Record of 131.724 mph in a 200 horsepower Benz that became known as the "Blitzen Benz." And in 1910, David Bruce-Brown, the 20 year-old American sensation, drove a Benz to victory in the 1910 American Grand Prize, a race that lasted almost six hours and covered 415 miles. 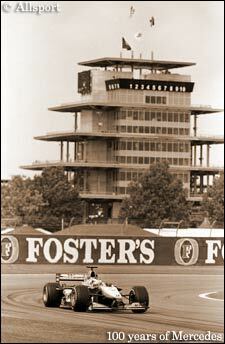 first Indy 500; the Benzs finished in 18th and 19th. In the 1912 Indy 500, Wishart was back with his gray Mercedes and Ralph De Palma entered another Mercedes and led for an incredible 196 of 200 laps, building a cushion of four laps, until a connecting rod let go on lap 197. De Palma slowed on the front straight and nursed the Mercedes for another lap until the car finally quit on the back straight, as the broken connecting rod had put a hole in the crankcase. To the cheers of the 80,000 people in the crowd, De Palma and his riding mechanic pushed the car back to the pits. But in the meantime, Joe Dawson in an American-built National, overtook the De Palma car and won the race. Interestingly, given Michelin's return to Formula One racing next season, Dawson was on Michelin tires, the French tire supplier's only win at Indy, although Michelin will get another opportunity in 2001 when the U.S. Grand Prix is run again at Indy. In the end De Palma finished in 11th and Wishart in 15th in the 1912 Indy 500. For the 1913 Indy 500, Wishart and De Palma had abandoned Mercedes for Mercer and Mercedes was represented by Ralph Mulford, who some thought had actually won the controversial first Indy 500 in 1911. Mulford went 500 miles in his gray Mercedes on the same set of tires and finished 7th. In addition, a Mercedes-Knight was entered, which was a car with a gray and white Mercedes chassis and a 4-cylinder Knight engine; it finished 5th in the race. In the 1914 Indy 500, Ralph Mulford entered a white and blue Mercedes with a Peugeot engine that finished 11th in the race. In the 1915 Indy 500, after four years of trying, it all came together for Mercedes and Ralph De Palma. The Mercedes De Palma drove already had a distinguished history before it turned a wheel at the Brickyard. In 1914, Mercedes had entered five cars as the factory team at the 1914 ACF Grand Prix held at Lyons, France, on July 14, 1914. To the astonishment of the French crowd and the then-dominant Peugeot team which had four-wheel braking systems as compared to the two-wheel system still being used by Mercedes, the Mercedes team bested the Peugeots and finished first, second and third, with the famous Mercedes driver Christian Lautenschlager leading the team to victory. to war and the 1914 ACF Grand Prix was to be the last major race in Europe before the outbreak of World War I. In the 1915 Indy 500, De Palma ended up driving one of the Mercedes team's 1914 ACF cars, which had been exported from Europe after the ACF race and before the British blockade was imposed. De Palma in his cream-colored Mercedes and Dario Resta in a French blue Peugeot had a fierce struggle during the 1915 race, with the Peugeot faster on the straights and the Mercedes Grand Prix car-turned-oval-racer quicker through the turns. Fittingly, given his disastrous bad luck in the 1912 Indy 500, Ralph De Palma's 4.5 litre Mercedes outlasted Resta, managing to hold on to first place, although his Mercedes again broke a connecting rod, this time with only three laps left. This time, the Mercedes made it home, spewing oil as it crossed the finish line. After De Palma's win in the 1915 Indy 500 in what was effectively a 1914 Mercedes Grand Prix car, there was a brief hiatus where Mercedes had no connection to the Indy 500 until the 1923 Indy 500 when three members of the famous 1914 ACF Grand Prix Mercedes Team - Christian Lautenschlager, Christian Warner and Max Sailer - were reunited as a three-car factory team entered by Daimler Motoren Gesellshaft, with the cars being fitted with the first supercharged engines to be used to compete in the Indy 500. But lightning did not strike twice, as the Mercedes team had a so-so run at the 1923 Indy 500, finishing 8th, 11th and 23rd. After the indifferent performance of the Mercedes factory team in 1923, and despite its competitors in European road racing like Maserati and Alfa Romeo competing from time to time at Indy, Mercedes made only episodic appearances at the Indy 500, typically in the hands of private entrants, such as in 1924 and 1948.
intended to race a pre-war Mercedes-Benz W165, a scaled down version of the W154/163 Grand Prix cars. The Mercedes-Benz W165 was a 1.5 litre V8 supercharged voiturette class car which was rated at 255 bhp. It had won the only race it had started, the Grand Prix of Tripoli in 1939, for which it was specially built. But then Caracciola's Mercedes-Benz W165 did not clear Swiss customs. Caracciola went to Indy anyway, and was hired by Joel Thorne, owner of the Thorne Engineering cars, who had previously driven in the Indy 500 himself before World War II and had been trying to win the Indy 500 for nearly a decade. Caracciola was scheduled to drive Thorne's "Big-Six" Thorne-Sparks racer, which was basically a supercharged version of the traditional 4-cylinder Offenhauser engine used at Indianapolis, with two more cylinders added to the engine block. His injuries were significant and it was only after several months of recuperation that he learned what had happened in the race (as it turned out, his Thorne Engineering teammate, George Robson, won the 1946 race for Joel Thorne). Once out of the hospital, Tony Hulman, who understandably felt somewhat responsible for this unfortunate turn of events, took Caracciola to the Hulman home in Terre Haute, Indiana to complete Caracciola's recuperation. Hulman and Caracciola remained good friends after this unhappy episode, until Caracciola's death in Switzerland of liver failure in 1959. By the way, Tony Hulman George, who now runs the Indianapolis Motor Speedway and is responsible for bringing Formula One back Indy, is the grandson of Tony Hulman, who himself died in 1977. 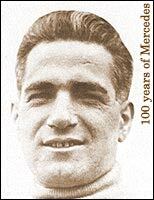 In addition to Mercedes' star driver Caracciola trying to bring the marque back to Indy, the factory itself gave some thought to taking on Indy at the end of 1950, when the shrieking superchargers of the Mercedes W154/W163 series of Grand Prix cars could once again be heard in the forests around the Eifel mountains on the Nurburgring circuit where the cars were being tested. Ferrari's Alberto Ascari had entered a Ferrari 375 Grand Prix car in the 1952 Indy 500, the race Mercedes had originally intended to enter; in the absence of the Silver Arrows that year, the Mercedes/Ferrari confrontation was deferred from 1952 until the Year 2000 when the U.S. Grand Prix at Indianapolis brought both famous marques to Indy for the first time together. 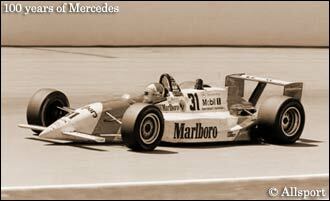 In addition to a Mercedes chassis and engine winning the Indy 500 with Ralph De Palma in 1915, in the 1994 Indy 500, Al Unser Jr. finished first in his No. 31 Marlboro-liveried Penske with a Mercedes-Benz V8 turbo, built by Ilmor, the origins of the collaboration that led to the Ilmor-derived Mercedes engine that is now used in the McLaren-Mercedes Formula One car driven by Mika Hakkinen and David Coulthard. (It should be noted that McLaren as a constructor - without a Mercedes engine - has also had its share of success at Indianapolis; a Sunoco McLaren/Penske chassis won the 500 in 1972 with Mark Donahue and Johnny Rutherford won twice in McLaren cars in 1974 and 1976). While Mercedes-Benz engines continued in the Indy 500s run from 1994-1996 in the hands of capable drivers like Bobby Rahal, Paul Tracy, Roberto Guerrero, Gil de Ferran and Davy Jones, a Mercedes engine has not won the Indy 500 since 1994 and, with the switch in 1997 to Aurora and Infiniti engines for the Indy Racing League, the Mercedes/Indianapolis connection for the foreseeable future will be limited to attempting to win the U.S. Grand Prix at Indianapolis, which should keep Mercedes, McLaren and Ilmor quite busy. For those who saw Hakkinen and Coulthard streaking down the front straightaway in the inaugural U.S. Grand Prix, there can be no doubt that Ralph De Palma and Al Unser, Jr. will not remain the only Mercedes-engined winners at Indy for too much longer. Thomas O'Keefe © 1995-2005 Kaizar.Com, Inc.